We’ve all heard of the dreaded Summer Slide, or the loss of learning that happens over the summer for students. This can account for almost 2/3 of the achievement gap by 9th grade. 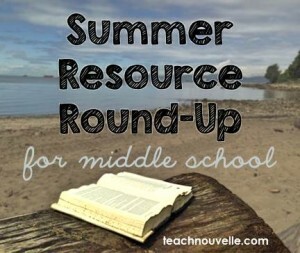 Whether you’re a teacher with a Summer Packet program in place, or a parent who needs some ideas to conquer this learning loss, here’s a list of summer resources for middle school students. Summer Reading Tips from Librarians – One suggestion I love? Check out activities at the local library! Libraries have tons of great activities including STEAM events, book giveaways, and author talks. 7th and 8th Grade Reading Lists by Imagination Soup – These lists are separated by genre, so your student can easily find something s/he’d love. Keep Them Reading by Modern Parents Messy Kids – Great tips to get reading on the schedule. My favorite? Read the book, watch the movie. Summer Reading Bucket List by No Time for Flashcards – This is a fun reading challenge for the whole family (or competitive siblings!). 5 Ways to Keep Your Students Writing All Summer Long by Scholastic – This is a great list for teachers of ways to promote summer writing. Kinetic City by AAAS – An online gaming platform offering STEM challenges, puzzles, and experiments. Don’t be turned off by the “online” keyword here – one activity has students make a menu of a “perfect meal” and then do a series of exercises to show how much effort it takes to burn calories. Kids Do Ecology by NCEAS – Cool articles and activities focused on ecology, with plenty of information for parents and teachers. Thanks for contributing and happy summer, everyone! Lasting Consequences of the Summer Learning Gap, Karl L. Alexander, Doris R. Entwisle, and Linda Steffel Olson, American Sociological Review 2007.